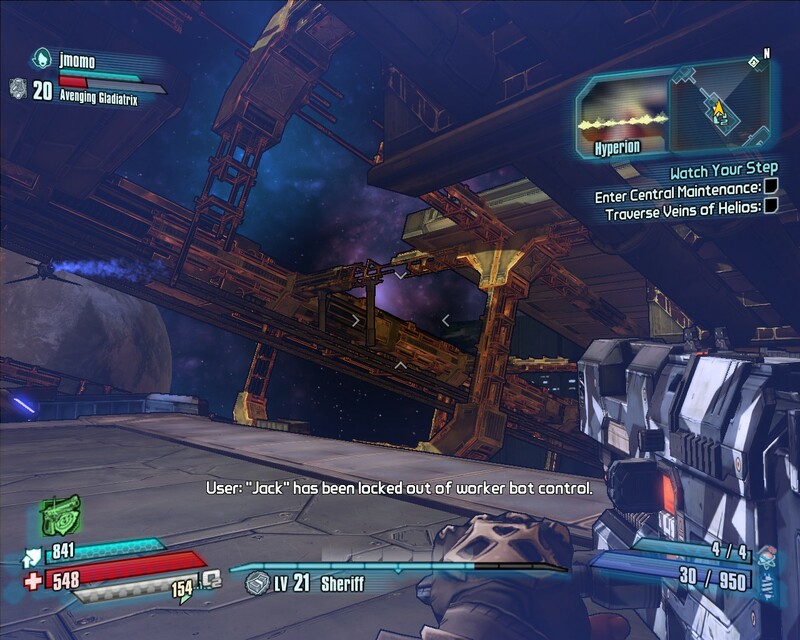 Tonight I finished Borderlands: The Pre-Sequel (see initial thoughts here), and then had some terrible games in LOL, so I’m a little cranky. I’ll try not to take it out on BLTPS. The later missions are mostly set on Helios, Hyperion’s H-shaped space station, which makes a nice change. There are some beautiful vistas– such as the one above, which is from the most interesting area, an under-construction area outside the space station itself. I think they missed an opportunity to show us something really huge. Helios is made up of half a dozen maps, so mostly you’re in a huge building with a few nice exterior sights. Saints Row IV, where you get up really high over an immense map, had more of a sense of hugeness. 1. Moxxi’s betrayal seems premature. Jack’s personality may be evil, but he hasn’t done much at that point, certainly not enough to justify killing everyone else on Helios. 3. Wait, didn’t BL2 tell us that Jack and Angel were masterminding the events of BL1? Yet there’s a picture on Jack’s desk of what appears to be a years-younger Angel. I’m not sure they thought this bit through. I began a playthrough with Fragtrap. It’s fun, though the Gunzerker will tend to annoy your co-op partners as it wastes ammo. My one complaint is that it takes awhile to fire up your skill.